Last night I was very happy to make my first QSO with Ham Radio blogger and fellow DXer Nash JN4VWH. We have been in contact via the Internet for quite some time, so as you can imagine it was very exciting and pleasurable to finally make QSO using our radio equipment. We have both tryed listening out for each other on HF for quite a while, but the bands have not yet been open when we have both found a mutual time that is convenient for us both to play radio. With propagation not quite reliable enough to work JN4VWH the plan had to change, so we decided to use more Technology that is available to give us a helping hand. 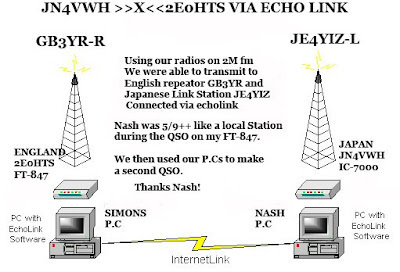 Using the Gb3YR repeater I was able to hear Nash JN4VWH coming through loud and clear via echolink through his local IRLP echolink link JE4YIZ-L. It was a real pleasure to finaly be able to speak with Nash on his new Icom 7000 using my Yaesu Ft-847 and an echolink enabled repeater and Link in England and Japan. 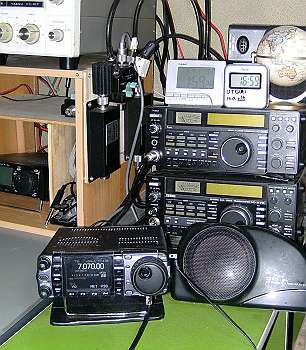 Truly great Ham radio Technology. We had some interesting overs exchanging reports and information, which then lead on to making a second contact using our computers which are both running echolink software. Once again a real pleasure to be making QSO with JN4VWH Nash. Radio and Computers can work well together!!! SkillWeld 2008 is part of the World Skills Olympics and fortunately for myself I get the fantastic job of helping to arrange the regional final to be held at the College where I work. Thanks to a great team and the fact that we have just recently merged with Park Lane College Leeds, Park Lane College Keighley(PLCK) held a very competitive event 'SkillWeld 2008' at the fantastic state of the art Fabrication and Welding workshop based at Keighley. The various welded joints were marked and examined by the judges to extremely high standards and there was quality competition from another college taking part at Keighley. But we still managed to deliver the goods with a victorious 1st, 2cnd and 3rd place finish. Well done P.L.C.K Lads!!! The event involves using Metal Inert Gas(MIG),Manual Metal Arc(MMA) and Tungsten Inert Gas(TIG) welding processes on Mild Steel, Stainless Steel, Aluminium plate and pipe of various thicknesses. These skills also come in handy for constructing radio masts for us radio Hams. The winner of this event has a chance to go through to the National final and then go on to the World Championship in Welding which will be held next year in Canada. With such an important event representing the future of UK skills we were honoured to be Live on Air on BBC Radio Leeds with presenter Daragh at the controls. As a radio Ham and ex radio DJ, you could guess that I was more than Happy to be talking with Daragh and teaching him how to put a MIG welded run on a piece of plate live on BBC Radio Leeds with 280,000 listeners. I got the chance to operate on the 3m band! hi. Thanks to everyone involved for all your hard work and it was great to meet Daragh. Here is Daragh in his mobile BBC Broadcasting VHF Station. A very nice hydraulic mast. In Second Place here is JOE using the TIG welding process to weld a penetrating root run in a mild steel pipe. The 2008 regional SkillWeld champion Craig Welding Pipe using the MMA process to cap the welded joint by using a weaving technique to create a nice looking welded bead/throat finish, as well as a flawless welded joint. I am looking forward to what happens next in this high pressure welding skills event and very happy to be helping the lads to get on with the help from my Colleagues. The next project for these guys might just have to be a tilt over mast. Meanwhile Ham News for 2E0HTS. Conditions on the HF bands were great during the contest last weekend and I managed many Stateside QSOs on 20m, 40m and amazingly using split VFO I worked quite few USA stations on 80m.